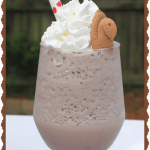 Toasted Marshmallow Chocolate Milkshake – With Peeps Minis! On a medium-size cookie sheet, place all but one Peeps Minis Chicks in a row. Place under your burner in the oven for 2 to 3 minutes, until they begin to melt and char on top. Take out of oven and let cool. Repeat this step but only let the marshmallows toast, so they are slightly burnt. Take out of oven and let cool. In a blender, pour milk, sour cream, cocoa powder, ice cream and charred marshmallows. Pour in a large glass and top with Rediwhip and one Peeps Mini Chick. Serve immediately.